Both of my oven barbecue ribs recipes below share the same cooking process but are baked in differing sauces. I have my favourite but it's up to you to choose. If it's too cold outside to venture out and fire up your smoker then these recipes are for you. There's absolutely no reason why you can't get that great barbecue taste in the comfort of your own home. The reason for a higher temperature is that it is much more difficult to keep things moist in a conventional fan assisted oven so the cooking time has to be that much quicker. It does make a difference to the texture and the flavour won't be the same as if the ribs had been smoked for a long period. So it's going to be different but that doesn't mean to say that you have to compromise, it's just a different flavor and a slightly less tender finish. The first of my oven barbecue ribs recipes is very easy to do with standard ingredients so why not give it a go this evening? Check the beef stock (if using a cube) because some contain gluten. Preheat the oven to 190°C, 375°F or gas mark 5. Heat the oil in a saucepan and add the onions, cook for about 3 or 4 minutes until translucent taking care not to burn them. Add the remaining ingredients (except for the ribs), bring to the boil and simmer for about 10 minutes. You now have your barbecue sauce. Place the barbecue ribs in a roasting tin and brush with a little of the sauce and slam them in the oven for 30 minutes. When the 30 minutes is up, carefully remove the ribs from the oven and pour off the fat, spoon over the remainder of the sauce and pop the barbecue ribs back in the oven for another hour and baste every 15 minutes. When the time is up, remove them from the oven and set aside for 15 minutes (if you can!) before tucking in. Out of all the oven barbecue ribs recipes that I’ve done this bbq sauce and pork spare ribs combination has the biggest kick to it. Of course if the mustard doesn’t do it for you and you’re a bit light on the Tabasco – well give the bottle another shake! Again it's going to be cooked at a higher temperature than you would in a smoker, click here to read why. Note: I bought a gluten free Worcestershire sauce recently an it contained neither gluten nor fish. Preheat the oven to 190°C 375°F or gas mark 5. Heat the oil in a saucepan and add the onions, cook for about 3 or 4 minutes until translucent. Add the remaining ingredients (except for the ribs), bring to the boil and simmer for about 10 minutes. 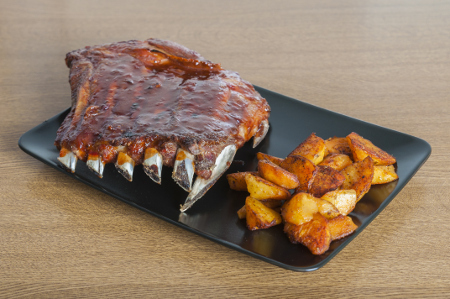 Place the pork spare ribs in a roasting tin and season with the pepper, brush with a little of the barbecue sauce and slam them in the oven for 30 minutes. After the 30 minutes, remove from the oven and pour off the fat, spoon over the remainder of the barbecue sauce and pop the ribs back in the oven for another hour and baste every 15 minutes. TIP - An extra teaspoon of chilli sauce into the mix won’t do it any harm, although I can’t say the same for you! So which of my oven barbecue ribs recipes is to be tonight?